For years, barbed wire has been the wire of choice for farmers and ranchers because it is extremely economical and is easily installed on any surface. It is typically used for cattle and bison, but is adaptable for a number of fencing needs. 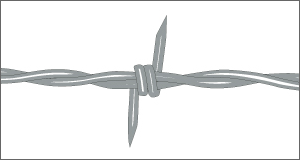 Barbed wire consists of two wire strands twisted together with either two or four point barbs placed at predetermined distances. The standard barb spacing is five inches; however we recommend three inch barb spacing for areas where high animal traffic, predator risks, or security are concerns. We offer barbed wire in a variety of strengths, coatings and styles from high-quality manufacturers including Bekaert, Oklahoma Steel, Keystone, Sheffield and Deacero. Introducing our new high tensile barbed wire by StaTite 50 which is stronger than traditional, low carbon barbed wire and will last significantly longer. If you need a barbed wire that won’t sag or stretch over time, is easy to install, and is virtually maintenance-free, this barbed wire fits the bill. It is available in 14g and 15.5g, both with a Class 40 coating; all of which will save you time, money, and maintenance headaches. For years, this has been the wire of choice for many landowners. Low carbon barbed wire can be easily manipulated but is prone to elongation, meaning it will stretch or sag over time. The coating of the barbed wire will determine how long it will last. Low carbon fences are available in two coatings: Commercial and Class 1. We call it the official fence of Texas. It’s tough, honest, and dependable – characteristics typical of Texas that deliver the proven performance that farmers and ranchers expect. Bekaert’s Cattleman 14g Barbed Wire is one of the strongest, longest lasting barbed wire fence on the market because of its reverse twist design and Class 3 galvanized coating. Gaucho 15.5g Barbed Wire is made of high tensile wire which means even though the wire is smaller in diameter, it still maintains the same strength as conventional low carbon products. Also known as barbless wire, twisted cable is used where barbed wire is unnecessary or prohibited. Barbless wire provides more strength than single-strand wire and protects valuable animals from injury.